It Started As a Lark. But It Turned Out To Be a Major Conversation-Starter About Climate Change. One day, I’ll look back fondly and tell my grandkids about the week I spent flooding the planet. It began as a lark. For the past few months, I’ve been writing installments of a serialized science fiction novel about a world in which the oceans have risen nearly 80 meters and most of the human race now lives at sea. As the characters in my story ventured closer to shore, I realized I needed a simple way to visualize what that world would look like. I took to Google Earth and Inkscape—both free, readily available software packages—and simulated 80 meters of sea level rise. The results were stark, post-apocalyptic images of city skylines, submerged. 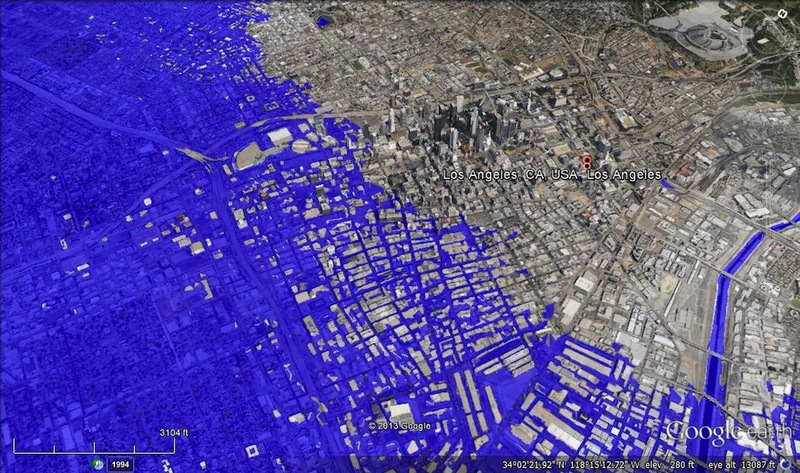 Los Angeles was completely inundated south of the financial district. In D.C, only the Washington Monument rose above the encroaching Potomac. Telegraph Hill was an island in the expanded San Francisco Bay. North Carolina was a warm, shallow sea stretching from the Outer Banks to Rocky Mount. Florida was gone. Pleased with the results, I shared some of those images on Twitter. Almost as soon as I posted my first image, I began receiving messages from followers asking me to submerge their cities, too. People were clamoring to see their hometowns flooded. The next morning, I launched #DrownYourTown, an interactive experiment in real-time GIS (geographic information systems) modeling, climate change, and Twitter. For two hours, I fielded requests from any and all to simulate sea level rise in their hometowns. Some images were disturbingly plausible, like a deluged Ocean City, Maryland, nearly wiped out by a 1-meter rise in sea level. Others were incredibly far-fetched, such as Reno, Nevada, which required a rise of 1,500 meters to get wet. Requests came from all over the world, including India, Australia, Croatia, and many island nations. By the end of the two hours, I’d created 52 models of sea level rise around the world. Along the way I shared information resources about climate change and sea level rise. I discussed how I made these models—and their limitations. I also received word that the #DrownYourTown hashtag was trending in several of the cities I had simulated. Over the next week, I continued taking requests (albeit at a much more modest pace) and released a step-by-step guide so that anyone interested could drown their own town. The software packages used to produce these models are freely available and the instructions are here. The project culminated with a street-level tour through Miami, the city that likely faces the greatest financial threat from climate change. With an anticipated rise of approximately 1.5 meters by 2100, Miami will be completely inundated. What’s absent in the images produced by #DrownYourTown are the people. Humans, as a rule, like to live by the sea. Globally, people are migrating toward coastlines, and a billion of Earth’s people live near sea level. Two-thirds of all major cities, including the world’s most populous, are located near the ocean. In the United States, nearly 125 million citizens live in coastal counties. Current projections of sea level rise by the year 2100 range from 0.5 meters at the low end to 1.5 meters at the high end, with the most likely scenario being between 0.8 and 1.0 meters. But even a meter of sea level rise will produce devastating financial and social consequences around the globe—the flooding of coastal cities, mass migration of climate refugees, salt-water intrusion into aquifers and farmlands. In Asia alone, a 1-meter rise will result in more than 100 million people displaced from their homes. In the South Pacific, island nations are making preparations to relocate their entire populations. By 2100, the nation of Kiribati will probably not exist. Still, even with so much potential for widespread destruction and disruption, communicating climate change risks is a constant challenge. #DrownYourTown used a novel approach to engage the public about sea level rise. The goal was not to provide the world’s most authoritative treatise on sea level rise but to get people thinking about how their own homes might be affected. #DrownYourTown eschewed the heavy-handed doom-and-gloom message of conventional climate change outreach (even the hashtag is a joke) while simultaneously presenting images of total destruction and asking the question: What if? Over the course of a week, the #DrownYourTown hashtag was used over 1,200 times, with a maximum reach of over 4 million Twitter users. Craig McClain, editor-in-chief of Deep Sea News, said, “I’ve never seen climate change outreach more successful”. Salon.com described it as “the official hashtag of the apocalypse.” #DrownYourTown resonated with people in a way that many other climate change outreach initiatives do not. It was both personal and interactive—the sea-level-by-request model created a conversation between people, rather than a one-sided broadcast of information. Sure, some of the images were far-fetched, verging on the absurd, but the value in #DrownYourTown was not the precision of the models but the ability to take global issues that are often difficult to visualize and make them local. For many people, #DrownYourTown brought the message home. For one glorious week in the fall of 2013, I got to play supervillain, controlling the sea with the flick of a mouse. But sea level rise isn’t a game, and it’s not something we can control. Coping with it will be a collaborative effort. As the effects of sea level rise ripple through our communities, we are all responsible for #DrownYourTown. Andrew David Thaler is a deep-sea ecologist and conservation geneticist based in the San Francisco Bay Area. He is the editor-in-chief of Southern Fried Science. Primary Editor: Kathryn Bowers. Secondary Editor: T.A. Frank. *Photo courtesy of Andrew Dave Thaler.